Got a Special Event or News about Lake Atitlan? Leave a comment to this post, and we’ll put it up as an individual post. It takes 12-24 hours to review comments and ok them. Besides prizes for first, second and third places, El Barrio will now award another prize for the Pub Quiz team with the best name. Starts at 7:30 PM. El Barrio just added Beef and Vegetable Pot Pies to the Tuesday night home-cooked meal special. Starts at 6 PM, and don’t be late, as portions are limited. Get a free tequila shot with every beer at Alegre Pub tonight. That’s because it is Mexican night, with discounts on Mexican beers (San Pedro’s biggest selection) and cocktails. Classical singing, pianso and opera by Louis Maire Beachamp at 7 PM. Plus gourment dining. Win a Bottle of Tequila at the Pool Party! First prize at Thursday’s boccie ball (Petanque) is a bottle of Tequila. 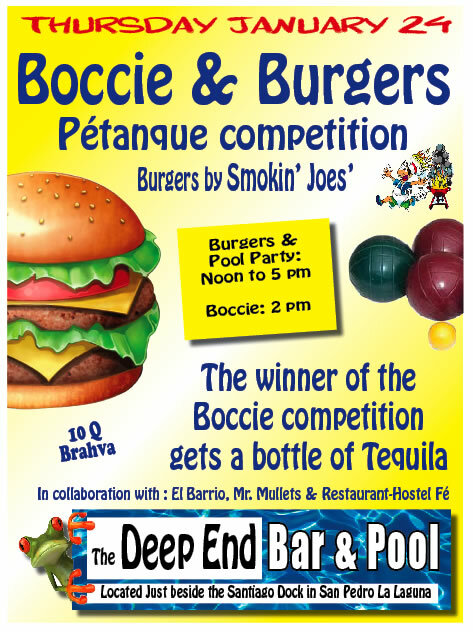 It takes place January 24 at The Deep End Bar and Pool (la piscina formerly known as Prince), next to the dock for boats to Santiago. The party goes from noon to 5 PM, and the boccie ball game starts at 2. Smokin’ Joes’ BBQ will cook up the burgers that made him Joe famous. Q10 Brahvas. The event is in collaboration with El Barrio Bar, Mr. Mullet’s Hostel and Hotel/Restaurante Fe, all in San Pedro. For more news about things to do at Lake Atitlan, visit Lake Atitlan. The town’s latest restaurant on the Seventh Avenue side just opened across the street from El Barrio. The Fifth Dimension has breakfast, drinks and other thing in a very chill space. Don’t miss the Home-made Ginger with dark rum! See Lake Atitlan for more travel tips. The party goes from 7-12 tonight, with live music by Toni y sus Amigos. A beer costs Q8, or Q20 for a liter of Brahva Extra. Other drink and food specials, too. There’s live Latino piano music at Hotel Mikaso, 7 PM. Plus Q15 Sangria and Bruschetta. Zoola’s All-day Mini-Festival kicks off by the pool at 2 PM, with Happy Hour all day. Heard good things about the curry at The Clover on Curry Night, every Friday. In the zona viva, Alegre’s Pub offers Q4 Cuba Libres (that’s right, just 50 cents US) and Q20 liters. For all the nightlife action, see Lake Atitlan Nightlife. The offical grand opening party for Restaurant Fe takes place starting at 6 tonight. It’s a curry buffet (Fe is already well-known for its curries in San Marcos) for Q50. The restaurant is across the street from the new Hotel Fe, at the former site of Villa Azul in the zona viva.